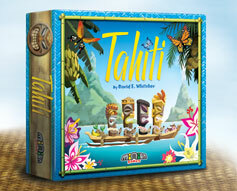 Minion Games has a new board game they're trying to fund over on Kickstarter named Tahiti. Check it out. A simple family friendly gateway pickup and deliver game for 2-4 players ages 10+ Your small island is peaceful and prosperous; so prosperous that your tribe has grown beyond its ability to sustain you! Fortunately, being a peaceful people you have chosen not to fight over what little there is. Instead, you set out in your seagoing Wa'a (canoe) to fish and gather crops from the many nearby islands. The fertility goddess Haumea has blessed these islands, and they are rich with fruits, vegetables, and spices. It is a matter of pride to collect the finest harvest for the village. Can you win the race against time and the sea, and prove that you are the best gatherer of all?